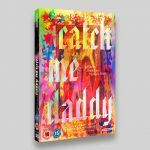 The wonderful Catch Me Daddy Blu-ray and DVD packaging was an incredible experience to work on. I can’t take any credit for the actual design for this, but my experience in dealing with print, hopefully meant the artwork printed as it intended! With three spot fluorescent Pantones, a ‘Micromotion’ varnish, a white plate and printed on rainbow board for the O-ring sleeves, the packshots don’t do the final artwork any justice. Catch Me Daddy is a film by Daniel and Matthew Wolfe, an unsettling, poignant and lyrical journey into beauty and brutality. As a footnote, the final files went out while I was away on my summer holiday. The Blu-ray O-ring hi-res pdfs weighed in at a huge 200MB, so I couldn’t send them tethered to my phone, trying to find somewhere to upload the final files in rural France, proved to be ‘an unsettling, poignant and lyrical journey’ for all involved.